I figured I better save that line for later today. The sun has just begun to peek through the hotel room curtains this morning here in Merida, Mexico. It is just before 7 a.m. here and already it is 21 degrees Celsius and heading to 37. If you’re like me and mathematically challenged when it comes to conversions, that’s 70 degrees right now and 98 expected later today. I Googled it. 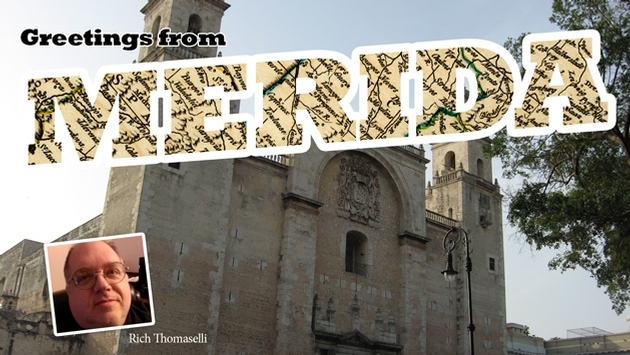 I am in Merida for the ASTA Destination Expo, and looking forward to three days of seminars and exhibits. This is my first visit to Mexico and, if you’re like me, you’ve already heard of all its beauties. If you know high school and college kids headed to spring break, you’ve heard of Cancun and Playa del Carmen. If you watched "The Love Boat" you know about Mazatlan and Puerto Vallarta. If you’re of the Frank Sinatra era, you’re familiar with Acapulco. But Merida has been something of a hidden gem. Tucked in the northern part of the Yucatan Peninsula, about three hours west of Cancun, Merida has been described as a brilliant mix of beaches combined with a bristling local culture that dates back centuries. I didn’t get to see much on the ride in from the airport as it was dark, and, to be honest, was a little disappointing as the main road in from the airport looked like any other main drag in suburbia – within the first 10 minutes of the 20-minute ride to the hotel I saw a Subway, Domino’s, Burger King, and Sam’s Club. But as I type this, and I look out the window behind me, the rising sun is beginning to cast a shadow on the Catedral de San Indelfonso not far away on Calle 60. You don’t see a 500-year old church built on Mayan ruins on the main drag in Poughkeepsie, N.Y., I can assure you. The ASTA Destination Expo begins later tonight with a welcome dinner and doesn’t kick off in earnest until Friday morning.